Pupil D is a very shy girl who dislikes reading as she thinks she is “not as good as her friends”. She lacked confidence, and avoided reading if at all possible. 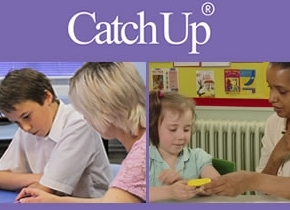 The class teacher thought that she was an ideal candidate for the Catch Up® intervention, as the one-to-one structured sessions would give her the confidence to read without having to worry about what her friends thought! In Year 3, her Reading Age was 6 years 5 months, 13 months behind her Chronological Age when she was tested using the Salford Reading Test in September 2011. Her confidence grew very quickly on the intervention. She enjoyed the sessions and the selection of books read. She always worked hard on the written tasks, and this was reflected in the improved presentation of her classwork. She progressed from reading Catch Up® Literacy level 6 to level 8 books in 22 sessions. When tested using the Salford Reading Test in February 2012, her Reading Age was 8 years - 2 months ahead of her Chronological Age. This represents a Reading Age gain of 19 months in 4 months on the Catch Up® Literacy intervention. Pupil D is now a confident reader in Year 4.